Howlin' Wolf Records: SIX STRINGS: SUPPORT DRIFTER: LONESOME HIGHWAY INDIEGOGO CAMPAIGN! SUPPORT DRIFTER: LONESOME HIGHWAY INDIEGOGO CAMPAIGN! Being a part of making movies and now web series is a dream come true for yours truly. I am working with a brilliant director and good friend Jason Braiser and my girlfriend Brittney Greer to help bring their new web series DRIFTER: LONESOME HIGHWAY into reality. 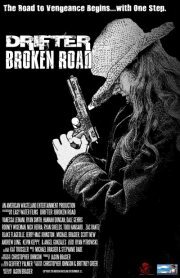 This is a sequel to their award winning series DRIFTER: BROKEN ROAD. The series is in pre-production and we are looking to raise funds to make this the most outstanding dark drama of revenge and adventure in a fragmented dystopian future possible. Essentially the series is a Western that takes place in the near future where America has been torn apart by a second civil war. I urge you to please help in anyway you can by going to the links below and finding out more about this series and the production company that are making them AMERICAN WASTELAND. Just clicking on the links below or sharing with your friends on THE FACEBOOK or on your blogs will be most appreciated. If you do share with your friends or donate let me know so I can say thank you and if you do have a blog I will follow it as well. I know this will come off a little biased seeing how I am friends with them both and all but I will say this about Brittney Greer and Jason Braiser. They are committed to their craft. Both have acted, produced, directed and written many projects before. They get results faster than most if not all. With very little they accomplish more visually than most bigger budgeted web series. A couple of visionaries is what they are recognizing the popularity with the web series format before most ever even heard of the concept. If you are looking for a professional production team to help on a media project check them out. They have worked on films, web series, music videos, commercials and helped others with their projects as well. Go to their website below and send any questions you may have about their projects or inquire if you are looking to hire someone for your own project. Together we can bring better stories to life rather than waiting on big studios to give us what we want. Thanks in advance for all your support. CLICK HERE TO GO TO AMERICAN WASTELAND! CLICK HERE TO GO TO DRIFTER: LONESOME HIGHWAY INDIEGOGO!